I have this quirky, foodie habit. When I really enjoy something at a restaurant or other eatery, I'll sit and pick the dish apart to try and figure out how I can make it at home. We have really limited the amount we're eating out - especially since our spending fast last March. We just don't want to spend our money on eating out - unless there's a special reason for it. One of the places we regularly stop to eat a quick meal is Costco. We love Costco's pizza - and at $10 for an 18" pizza, it serves our family for two meals, and gives me a much needed break from cooking. But, one of the other things I love to eat at Costco is a little thing they call a Chicken Bake. Terrible name. (Chicken Bake? Pig roast? Duck hunt?) But, it's good, in spite of its name. It is this long, round, pizza dough thingy filled with chicken, Caesar dressing, Parmesan cheese, and bacon. One day, as I was sitting at Costco with one of my dear friends chowing down on a Chicken Bake, I looked at her and said, "I could totally make this at home." 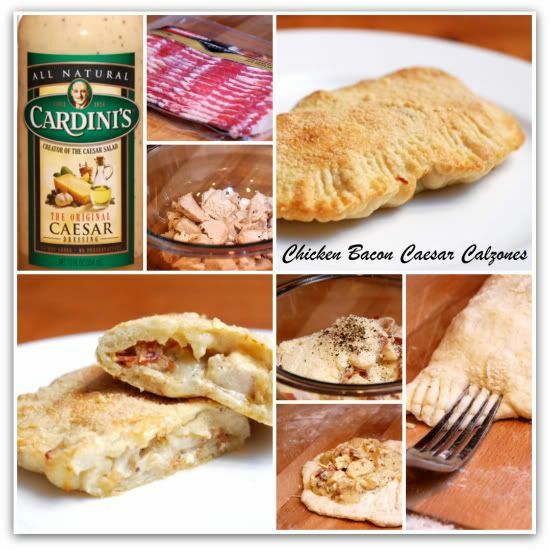 So, last night, I made these Chicken Bacon Caesar Calzones - my version of Costco's Chicken Bake. And, everyone in my family loved them. And, plenty of bacon. Chunks of bacon. Not bits. 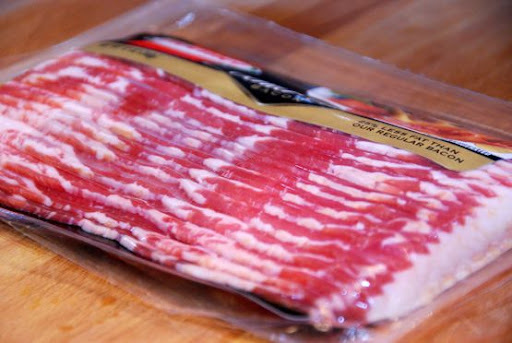 I like big chunks of bacon. This recipe is so easy. 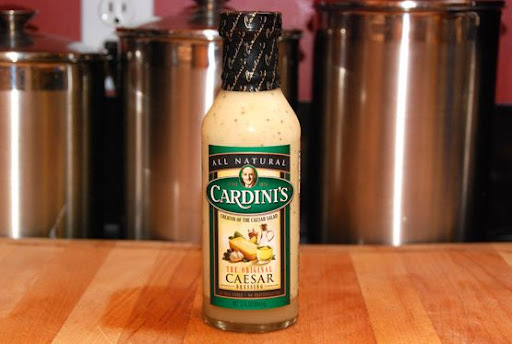 All you have to do is roast some chicken breast, fry up some bacon, and toss them in a bowl with Parmesan cheese, Cardini's Caesar dressing, and some freshly ground pepper. 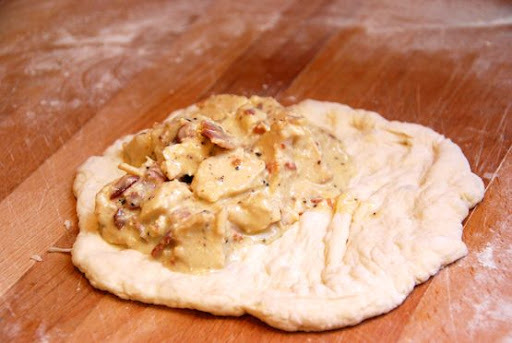 Place the filling on one half of the dough. 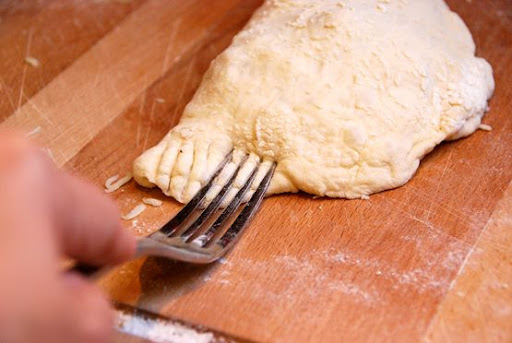 After topping the filling with Mozzarella cheese, fold the dough over, and press the edges with a fork to seal. Bake at 400 degrees for 20 minutes, brush the tops with melted butter, sprinkle with a bit of Parmesan cheese, then bake for 5 more minutes. 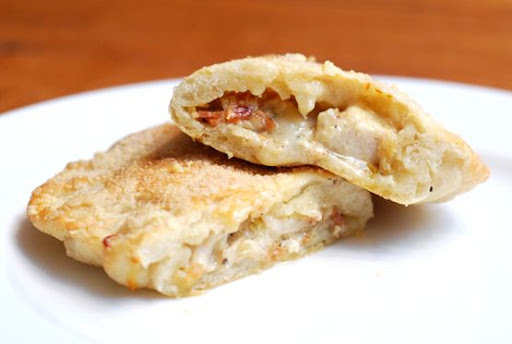 Cheesy, delicious, savory, wonderful Chicken Bacon Caesar Calzones! These would be some great football eats this weekend! 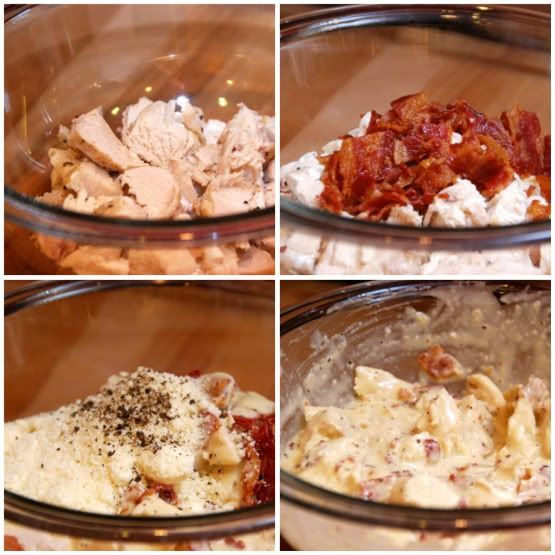 Combine chicken, crumbled bacon, dressing and Parmesan Cheese in a medium bowl. Set aside. Cut pizza dough into four sections. Roll out into rounds on a floured surface. Top 1/2 of one pizza round with filling. Top filling with 1/4 of Mozzarella cheese. 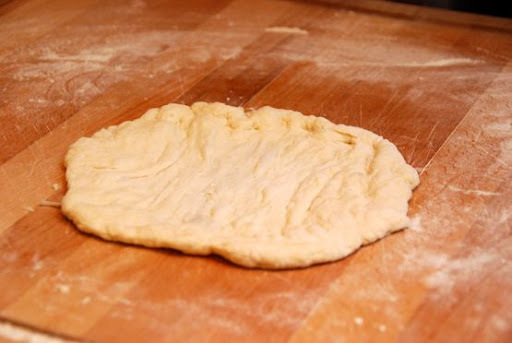 Fold over dough to form half moon shape. Using a fork, press edges down to completely seal. Repeat process with remaining dough, cheese and filling. 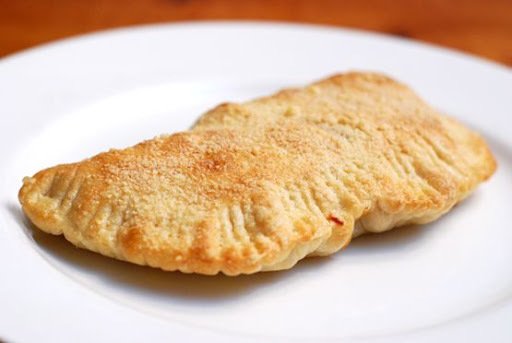 Place calzones onto a greased cookie sheet. Bake at 400 degrees for 20 minutes. Remove calzones from oven and lightly brush with melted butter. Sprinkle with Parmesan cheese. Return to oven and bake for 5 additional minutes. *Most local pizza places will sell you rounds of their pizza dough for a very small cost. Our local pizzeria sells it to us for $1.50 for one large ball of dough. *This recipe makes 4 dinner-sized calzones - essentially a quarter of a pizza per calzone. Double or triple if making for a larger family/crowd. You could also make appetizer-sized mini calzones by chopping the chicken finer and rolling out smaller rounds of dough. I've had those at Costco too- they're yummy! I will have to try your version- they look great too! Me want one of those. oh Sarah. You never cease to amaze me. Looks like we'll be having 2 Short Stop meals next week...cheesey broccoli soup and chicken bacon Caesar calzones... can hardly wait! Another great post. I love the photographs you take, by the way. Amazing. I love the idea of buying the pizza dough from a pizzaria. Who knew? I make pizza's sometimes at home, but the dough never seems right. I usually just use some extra bread dough when I'm making bread, which doesn't make the right kind of crust. And I don't want to make a whole batch of dough just for pizza, so this is a great idea! Just put 'em right here... (Pointing to my thighs)... 'Cause I'm loving those flavor combos! Where did you get that fab idea of putting Caesar dressing in a calzone? You're so smart. you're boys' wives are going to have some big shoes to fill! They probably won't even come close to your expertise! Isn't Costco great? I haven't had a chicken bake in years, but I do remember them! definitely gonna be trying these. about how big do you make each one (when you roll out the dough)? This looks so good! I didn't know you could buy pizza dough like that. I'm going to check into it. I would say "I can't believe you figured out a recipe for those," but this is you and you're amazing like that. Cannot WAIT to try these! I roll them out to about 6 inches in diameter. But, you can make them as big or as small as you'd like - even making bitter ones for you and Chuck, and smaller ones for the kiddos. My mother-in-law is the one who inspired me to love cooking and baking and to serve up "love" when serving a meal to my family! She was always willing to teach me, to let me watch her in the kitchen - even when my husband and I were dating, and I'm incredibly grateful to her for that. I hope I can inspire my sons' wives in the same way! That is wonderful about your MIL. My mom died from breast cancer when I was in the 8th grade so I cooked for my dad and brother through High School....it was pretty sad! When I got married at 26, my then MIL taught me more and I'm still so thankful for her. Great recipe Sarah! My sister and I made these last night and they were a huge hit. I've begun looking through your recipes when I need something new to make and they're always fabulous! I made these tonight and OH MY were they good. I used a thin crust pizza dough, and added a small chopped onion and a few cloves of minced garlic to the filling. Before adding them, I cooked them up in the leftover bacon grease until translucent and just beginning to brown at the edges. These calzones were absolutely scrumptious...I loved that the dressing didn't obviously taste like dressing, just a wonderful backdrop to the other flavors. MMMM. All I have to say is that if you ever write a cookbook, I'll be the first in line to buy it. Just this week I've made these and your beer bread.